This deep image of the Virgo Cluster shows the diffuse light between the galaxies belonging to the cluster. The dark spots are where bright foreground stars were removed from the image. Messier 87 is the largest galaxy in the picture (lower left). The Virgo Cluster is a cluster of galaxies whose center is 53.8 ± 0.3 light years (16.5 ± 0.1 million parsecs) away in the constellation Virgo. The cluster forms the heart of the larger Virgo Supercluster, of which our Local Group is an outlying member. The Virgo Cluster has about 1300 (and perhaps up to 2000) member galaxies. Its mass is about 1.2×1015 solar masses out to 8 degrees of the cluster's center or a radius of about 2.2 million parsecs. 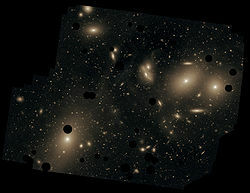 Many of the brighter galaxies in this cluster, including the giant elliptical galaxy Messier 87, were discovered in the late 1770s and early 1780s. They were included in Charles Messier's catalogue of non-cometary fuzzy objects. Described by Messier as nebulae without stars, their true nature was not recognized until the 1920s. Many of the member galaxies of the cluster are visible with a small telescope. Its brightest member is the elliptical galaxy Messier 49. ↑ Mei, Simona et al (2007). "The ACS Virgo Cluster Survey. XIII. SBF Distance Catalog and the Three-dimensional Structure of the Virgo Cluster". The Astrophysical Journal 655 (1): 144–162. doi:10.1086/509598. ↑ Fouqué P. et al (2001). "Structure, mass and distance of the Virgo cluster from a Tolman-Bondi model". Astronomy and Astrophysics 375 (3): 770–780. doi:10.1051/0004-6361:20010833. This page was last changed on 11 July 2016, at 19:00.